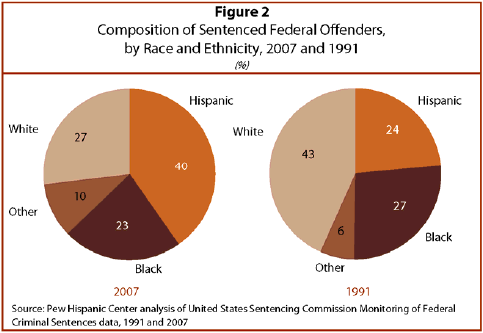 In 2007, four-in-ten (40%) offenders sentenced in federal courts were Hispanic, a share larger than whites (27%) or blacks (23%). This is a marked change from the demographic composition of offenders sentenced in 1991, when 24% of offenders were Hispanic, 43% white and 27% black. 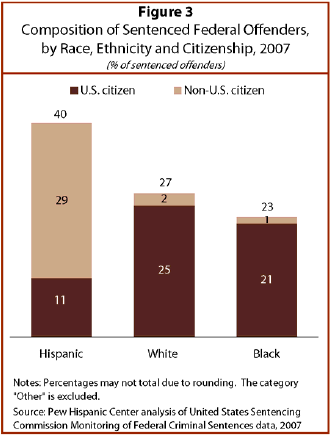 Latino offenders are far more likely than other offenders to be non-citizens. Among Latino sentenced offenders in 2007, more than seven-in-ten (72%) did not have U.S. citizenship. In comparison, among white and black offenders, small shares did not hold U.S. citizenship – 8% and 6% respectively. Non-citizen Hispanics represent a significant share of all offenders sentenced in federal courts. 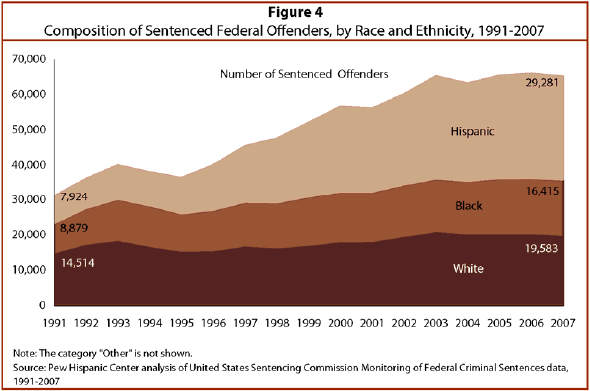 In 2007, 29% of all sentenced federal offenders were non-U.S. citizen Hispanics, larger than the share of offenders who were white or the share who were black. Between 1991 and 2007, the number of offenders sentenced in federal courts more than doubled (118%). During this same period, the number of sentenced Hispanic offenders nearly quadrupled (270%), from 7,924 in 1991 to 29,281 in 2007. Hispanics accounted for more than half (54%) of the growth in the number of sentenced federal offenders over this period. To a large extent, the growth in the number of Hispanics sentenced in federal courts has come from Hispanics who do not hold U.S. citizenship. 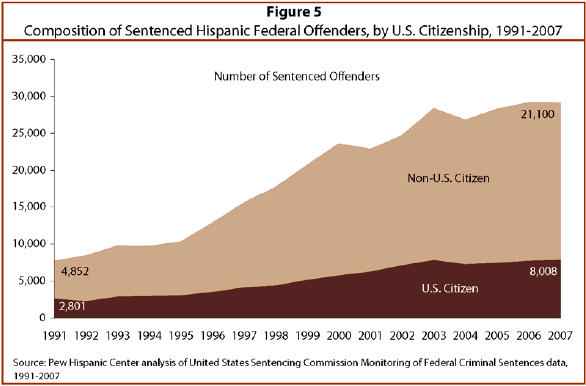 Between 1991 and 2007, Hispanics without U.S. citizenship accounted for 41% of the growth in the total number of offenders sentenced in federal courts. 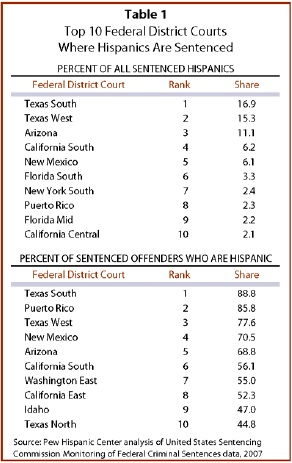 In 2007, more than half (56%) of all Hispanics sentenced in the 94 federal district courts were sentenced in one of five courts: the Southern (17%) and Western (15%) districts of Texas, the District of Arizona (11%), the Southern District of California (6%) and the District of New Mexico (6%). All five courts are located along the U.S.-Mexico border. Accordingly, majorities of those sentenced in 2007 in the Southern District of Texas (89%), the District of Puerto Rico (86%), the Western District of Texas (78%), the District of New Mexico (71%) and the District of Arizona (69%) were Hispanic. In all five districts, non-U.S. citizen Hispanic offenders made up majorities of all Hispanics sentenced. This geographic distribution of Hispanic offenders was less concentrated in 1991, though a similar concentration of cases in border districts was evident. In that year, 52% of all Hispanics sentenced in federal courts were sentenced in one of five district courts: the Southern District of Texas (20%), the Western District of Texas (10%), the Southern District of California (9%), the Southern District of Florida (7%) and the District of Arizona (6%).